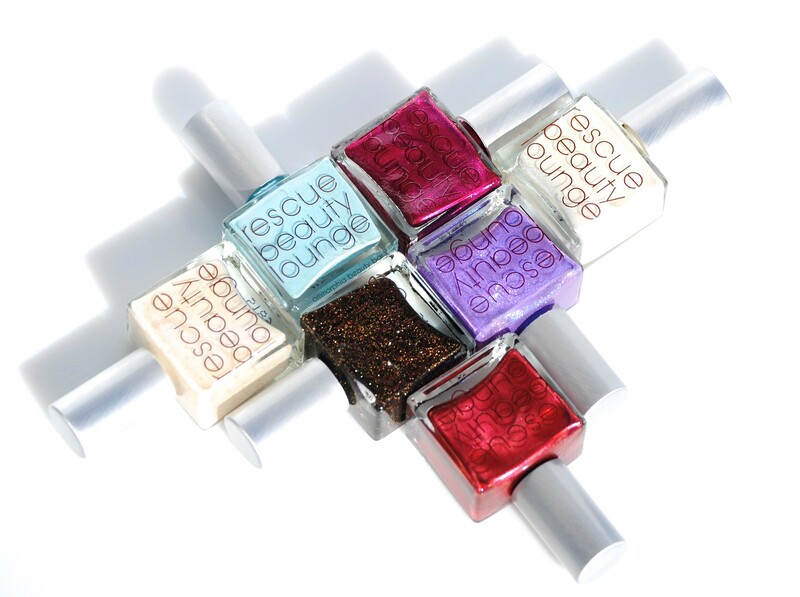 There’s a good reason why Ji Baek of Rescue Beauty Lounge has such a loyal fan base: she understands what makes lacquer lovers tick, and has welcomed the world to becoming an integral part of the creative process behind several of her nail polish collections. After the resounding success of the two previous iterations, Ji once again put out the call for fans to submit a vision of their dream polish shade, and after receiving thousands of entries (which were then narrowed agonizingly down – I mean seriously, how can a person choose from so many original ideas? ), the list was finalized to the seven hues shown here. Therefore and without further ado, presenting The Fan Collection 3.0 – enjoy! This colour truly reflects the inside of as seashell – shiny, with a mellow white mica and flashes of pink that swim through its slightly golden-grey shimmer – you can practically hear the waves by looking at the bottle. Ethereal | An opalescent white shade that displays some sheerness with the first coat, albeit still giving good coverage – and which applies non-patchy and self levelling. This pearly shade gives way to a visible pink flash and while not super glossy, the finish is quite shiny just the same. Note that longer nails may still see some translucency after 2 coats, but I personally love that look. Electro Glacier was the most challenging of the collection, requiring many variations (there were tons of non-stop mixing going on – making this the most demanding fan color thus far) and boy, am I glad we stuck with it! Creating an icy blue that would stay light, but still be a true blue, took some magic. This blue iridescent sparkly delight is jammed-packed with shine. Electro Glacier | An icy baby blue with ultra fine and tightly condensed shimmer. The formula leans slightly thick but is still easily spread along the nail with a quicker dry time than most of the others here, so make sure to load up your brush and work fast. Opaque enough by the first coat, you’ll need a second for complete coverage. Note: be prepared for some glitter spread upon removal. I am super technically challenged, but not one to give up. we focused on creating a lava-like color since black pigment by itself is very dense. I replaced the black matte glitter with gold and orange sparkles. This color dries to a matte. I’m really into this look, but one swipe of our super-shiny top coat will transform Many Splendors into live, hot, molten danger. Many Splendors | A sheer charcoal base that’s brimming with gold and fiery amber ultra fine glitter, in a formula that appears somewhat thin at the first coat, but achieves good coverage by the second. This shade comes to a velvety matte finish (very hard to capture in photos; much more cohesive and smoother than appears in the first swatch photo) with the shimmer keeping it from coming off as too flat or 1-dimensional (soft grit to the touch). Adding top coat does all kinds of crazy magic to Many Splendors and makes it come alive. This is a sophisticated, soft white mica base with a flash of lavender and golden flecks. It applies like a dream and yep – all year around and for every occasion. Golden Horn | An opalescent ivory hue with irregularly shaped gold flecks that appear to be suspended beneath the surface layer – in a formula that falls semi-sheer at first, but reaches a decent opacity by the second. There’s a subtle lilac flash flash seen at some angles that add a nice depth of tone, and the finish is relatively smooth to the touch. Bonus: no glitter migration upon removal. Sanguine | A luscious claret that’s loaded with shimmer of the glass-flecked variety; this gives the illusion of banked embers and that lit-from-within glow that’s just so mesmerizing (and which I totally love). Highly pigmented, this shade can almost be a 1-coat-wonder if you load up your brush enough, but I prefer the look with 2 coats. Self-levelling and super glossy at the finish, there’s no staining upon removal – bonus! Vixen by Sassy Shelly | An intense magenta with similar glass-flecked shimmer to that of Sanguine, with that same inner fire and hypnotic tone. There’s a jelly-like quality to the formula, bearing a self-levelling application and insanely glossy finish — although be warned that there is some mild staining potential here, so do not skip your base coat. Ok. This might win top honors at a shimmer contest. It really reminds me of our long-ago Scrangie, but on steroids. This lavender base enmeshed with flecks of blue glass makes this formula glidingly, oh-so-easy to apply — it’s a win-win. Galaxea | A high-voltage violet/lilac hue with prismatic glitter that gives off pink, blue & purple flashes. The formula falls this side of thick (similar to that of Electro Glacier), but is nevertheless easy to work with and provides excellent coverage even by the first coat. While shiny on its own, this shade turns almost supernatural with an addition of top coat – spectacular! Note: be prepared for some glitter spread upon removal. 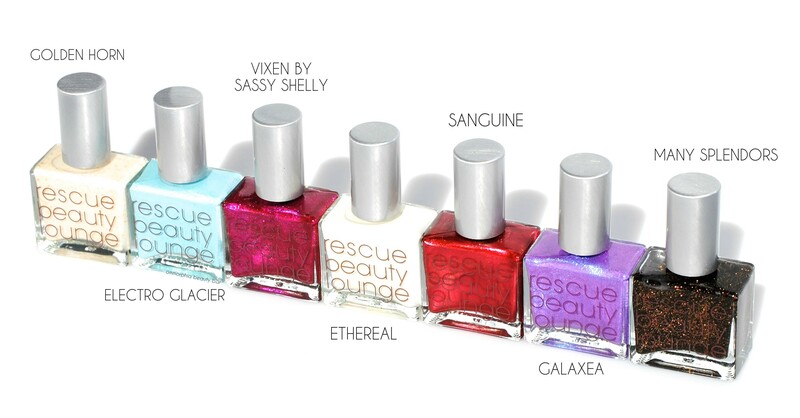 Upon looking at the shades when I first received them, I was positive that my favourites would be the Ethereal, Golden Horn (just proves my weakness for whites) and Electro Glacier (my other weakness for anything remotely aquatic-looking), and while I was correct about ethereal and Electro Glacier, I was totally unprepared for the way Sanguine, Vixen by Sassy Shelly, and Galaxea would grab me. Many Splendors is an interesting contradiction; what appears to be a shimmery black hue, turns out to be many sided and also adds a tactile and visual appeal – and while matte may not be everyone’s cup of tea (I confess to loving a matte and/or textured finish), it’s a shade that will blow you away once seen with a layer of glossy top coat. Believe me. I was mesmerized by Sanguine too! It looks lovely on you!! Thanks so much, Lygie! I love how much depth there is in that shade….surreal, almost! Why are your bottle shots always so beautiful?!? I love Ethereal on you! LOL! Thank you, my friend! It’s easy to photograph something that’s THIS lovely! Thanks, Kellie! What amazing company I’m in – so happy to be part of the RBL family as well! Pretteh!!! Everything is so pretteh!! Thanks, Sam! I was totally unprepared for how intense it is but I love it! Aww…thanks, Valesha! So happy to be part of such amazing company!